By: Yellowstone Gate | 1 min ago View as "Clean Read"
A rare thermophilic virus found in the hot waters of Yellowstone National Park may be behind strange animal behavior in the region. Local and regional public health officials are working with researchers in Yellowstone National Park to learn more about the origins and life cycle of a strange virus that could be causing highly aggressive behavior in small wildlife in the park and surrounding areas. While little is known about the newly encountered, so-called “geyser virus,” park officials stress that it doesn’t appear to pose an immediate threat to human health. But they are advising park visitors to take extra precautions around any small animal that doesn’t appear to display typical signs of fear, or that shows outright aggression. Concern about the geyser virus first arose after a series of bizarre wildlife encounters involving backcountry skiers and hikers in and around Yellowstone over the winter. Visitors reported uncharacteristically aggressive behavior from a variety of small mammals, ranging from otters to beavers to pikas. A Cooke City woman snowshoeing with her dog in the Gallatin National Forest just north of Yellowstone reported that a marten attacked and killed her 125-pound Great Pyrenees. Authorities did not initially believe that a marten — a 4-pound, 2-foot-long member of the weasel family — could have killed the dog. A marten near Yellowstone National Park attacked and killed a 125-pound dog after suffering a strange viral infection. But a smartphone video taken by the woman, whom authorities did not identify, corroborated the account, prompting an investigation into whether the marten suffered from rabies or some other disease. Authorities ruled out rabies, and have declined to release the video of the incident, citing an ongoing public health investigation. A pika near Mammoth Hot Springs that chewed and clawed through a Yeti cooler to get to a bag of turkey jerky. A uinta ground squirrel that fought off two gray wolves in the Lamar Valley. A yellow-bellied marmot at a cabin west of Cody, Wyo. that broke into a bear-proof, steel food storage box and ate an entire box of Lucky Charms cereal. Thatch said there had been no reports of human injuries, and that park officials did not yet have a solid theory for the cause behind the aggressive behavior. Wyoming Rep. Teetrick Huddleton (R-Cody) said he advocated an immediate “quarantine” on all small animals within Yellowstone. “Teetrick J. Huddleton is calling for a total and complete shutdown of animals exiting Yellowstone National Park until our country’s representatives can figure out what the hell is going on,” Huddleton said at a news conference Sunday. “When you’re talking about a beaver leaping 30 feet through the air to bite through the jugular vein of a beloved family draft horse, as happened to a friend of my cousin’s next-door neighbor’s sister-in-law, I think we need to act swiftly and decisively,” he said. Sharm Dresden, wildlife policy specialist for the Friends of Yellowstone Alliance, said the solution wasn’t to prevent animals from entering the park, which was virtually impossible. A microbiologist with the Centers for Disease Control and Prevention said there appeared to be a complex and interconnected life cycle at play with the geyser virus, which made it tricky to study and difficult to contain. “Animals’ aggressive, almost zombie-like behavior appears to be largely a result of an infection that raises the body temperature on their small bodies to an incredible extent, many degrees above their normal comfort zone,” said Terrence Rovak, lead CDC investigator in Yellowstone. 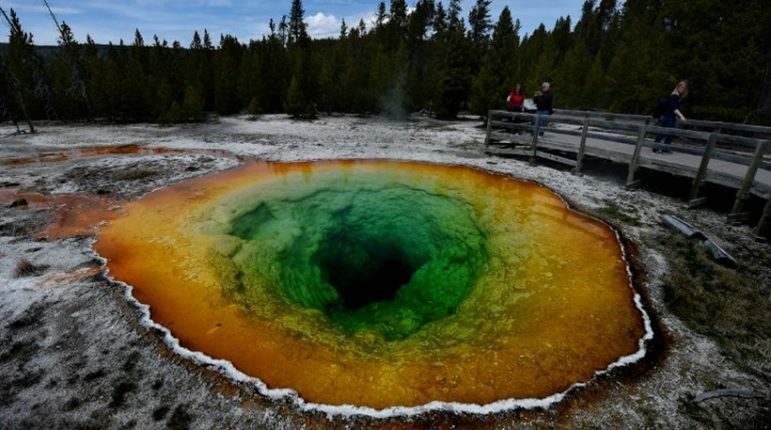 Rovak said a thermophilic virus named parasitizes Sulfolobus, found in Congress Pool at Norris Geyser Basin, appeared to be a key player in the disease. After about a day, the virus mutates into a highly potent strain that is carried by the emerging ephydrid flies onto small mammals in the park. They become infected, and see a steep spike in body temperatures, which plays a major role in their aggression, Rovak said. “At least that’s the theory we’re working with now, which could be completely wrong, because we just don’t have enough information yet,” he said. Rovak declined to speculate whether the geyser virus could ever mutate to a strain that infects humans, but advised caution until investigators know more. YELLOWSTONE NATIONAL PARK, WYO. — Winter visitors to Yellowstone National Park say they are largely unaffected by the partial federal government shutdown, thanks mainly to private concessioners picking up the slack, and federal workers showing up without pay. 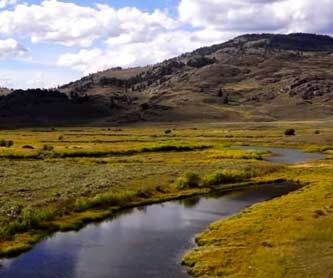 Microbes found in the extreme environments of Yellowstone National Park thermal features are key to a major financial investment in a new form of protein that could find its way into commercial foods within a few years. Sustainable Bioproducts, a biotechnology company developing a new way to grow edible protein, announced last month that investors have pledged $33 million toward commercializing a process that has its roots in a Montana microbiologist's research into tiny organisms that thrive in the hot, acidic waters of Yellowstone. The young male wasn't an Olympic athlete in training, but his daily movements were tracked and recorded with amazing precision. He wasn't on a crash diet, but what he ate was well-known, along with where and when he ate it.